Finger Ring Set with Epoxy Clay, Silver/Gold Plated Metal Components and Swarovski Elements. Ring is adjustable to fit most finger sizes. Diameter of Face- 25mm. 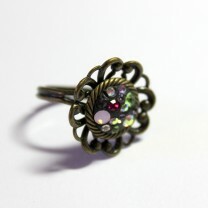 Finger Ring Set with Epoxy Clay, Antique Gold Plated Metal Components and Swarovski Elements. Ring is adjustable to fit all finger sizes. Diameter of Filigree - 20mm. Finger Ring Set with Epoxy Clay, Faceted Czech Glass and Swarovski Elements. Ring is adjustable to fit all finger sizes. Diameter - 15mm. This unique item is SOLD. A similar item can be custom-made for the same price. 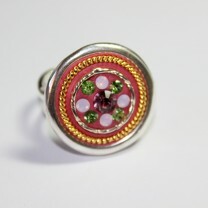 Finger Ring Set with Epoxy Clay, Czech Glass, Silver Plated Components and Swarovski Elements. Ring is adjustable to fit all finger sizes. Diameter - 15mm. This unique piece is SOLD. A similar item can be custom-made for the same price. Finger Ring Set with Epoxy Clay, Copper / Gold / Antique Gold Plated Components and Swarovski Elements. Ring is adjustable to fit all finger sizes. Diameter - 20mm. Finger Ring Set with Epoxy Clay, Silver Plated Components and Swarovski Elements. Ring is adjustable to fit all finger sizes. Diameter - 20mm. Finger Ring Set with Epoxy Clay, Silver / Gold / Antique Gold Plated Components and Swarovski Elements. Ring is adjustable to fit all finger sizes. Diameter - 25mm. Finger Ring Set with Epoxy Clay, Silver / Gold / Antique Gold Plated Components and Swarovski Elements. Ring is adjustable to fit all finger sizes. Diameter - 20mm. Finger Ring Set with Epoxy Clay, Faceted Czech Glass and Swarovski Elements. Ring is adjustable to fit all finger sizes. Diameter - 15mm. This unique piece is SOLD. A similar item can be custom-made for the same price.